Dr. Charles McDougal was one of the world's most dedicated Tiger researchers and prime advocates of their conservation. He gained his PhD in anthropology, but since 1961 spent most of his time in Tiger country in Nepal and India. His article "Leopard and Tiger Interactions at Royal Chitwan National Park, Nepal" was first published in 1988 and is presented here unabridged by his courtesy. Earlier studies in and adjacent to the park found evidence of high Leopard mortality. Suitable habitat was not occupied for extended periods, suggesting that the population was experiencing difficulty replacing itself. Under certain conditions Leopards succeed in co-existing with Tigers, the former being socially subordinate to the latter. Nevertheless, Leopards are not common in habitat where Tiger density is high. They are most prevalent on the peripheries of the park, sandwiched between prime Tiger habitat, on the one side, and cultivated village land on the other, dependant on both natural prey and domestic livestock. Tigers as well as humans contribute to Leopard mortality. During a period of 21 months, six Leopard deaths were recorded. Although all occurred within 7 sqkm, this does not represent the total area the Leopards had used. Five were killed by Tigers; the cause of death in the sixth case is unknown. In April 1986 the remains of a subadult male, estimated to be 18 months old, were discovered in Sal forest at the foot of some hills. Wounds indicated that it had been killed by a Tiger, the tracks of which were discovered nearby. Two months later, the decomposed carcass of a large Leopard, presumed to be a male, was discovered in nearby riverine habitat; it was not possible to ascertain the cause of death. 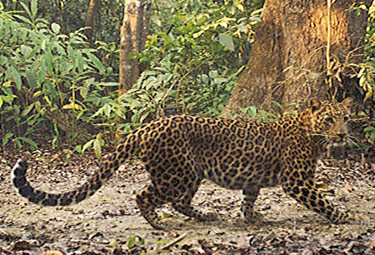 Ten months after the first Leopard had been killed, a female Leopard and her two small cubs were walking along a path through grassland near the Rapti River, on the edge of the park, when they were encountered by a tigress. The latter killed the mother Leopard, dragged her body 75 metres, and devoured everything except the head and front paws. The two cubs escaped but returned the next night, when the Tigress found and killed them not far from where she had fed on their mother. The Leopard cubs were discovered seven metres apart, where they had been dragged in opposite directions by the two small (six months old) cubs of the Tigress. The skulls of both, one a male and the other a female, weighing 5.7 and 5.2 kilograms respectively, had been crushed; their bodies were intact except for about half a kilogram of flesh which had been eaten from the hindquarters of each by the Tiger cubs; the tail of one was also missing. During the next 11 months, when the resident female was not replaced, a large male Leopard intermittently used the area. In January 1988 his 4-5 day old remains were discovered in a patch of partially burnt grass. Canine punctures at the nape of the neck, the vertebrate of which were shattered, as well as wounds on the back left no doubt that he had been killed by a Tiger, most probably an adult female. Two factors appear to have a bearing on the extermination of so many Leopards by Tigers in one area during a short period of time. First, subsequent to the establishment of the park in 1973 effective protection and good management have led to an increase in the prey base and a commensurate rise in Tiger density. In a tract of western Chitwan of just under 100 sqkm, including the smaller area where Leopard mortality was recorded, the number of resident breeding adult Tigers doubled from four to eight in the 11 years 1976-87. Secondly in this sector, very little peripheral habitat remains available for Leopards. As human pressure inside the park has been largely eliminated by protection, it has increased outside, with consequent clearing of adjacent forest and scrubland. Now prime Tiger habitat on one side of the Rapti River, the park boundary, faces open terrain with little cover on the other. These factors would increase the likelihood of confrontation between Tigers and Leopards.